I am Darwin Hathcock, Chief of Police for the Town of Smithville. 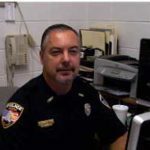 I have been employed with the Town of Smithville Police Department since 1995 and became Chief of Police in 1998. I attended the Delta community College Law Enforcement Training Academy. The Town of Smithville has a population of just under 900. Our Department has one full time Officer (myself) and five (5) part time officers. We are located in the north east corner of Monroe County. We dispatch through the Monroe County Sheriff’s Dept. Our goal is to treat everyone with respect and to keep the communities trust.